"I've been trying to update iTunes with no success. I keep getting the error 2 when I try to update it and I need to update iTunes so I can restore an iTunes backup to my iPhone. Does anyone have any suggestions on how to overcome this error and get iTunes updated?" These iTunes errors are quite common and can be quite frustrating as well especially if you need iTunes to restore a backup to your device or backup the data on the device. In this article, we will offer a number of solutions to overcome the iTunes error 2 and allow you to update this all-important program. If you get an error code 4013, you can check this post. If you get an error code 9, you can check this post. If you get an error code 21, you can check this post. Sometimes, especially if you are using Windows, the Security Software you're using may prevent iTunes from communicating with Apple Servers and hence fail to update as required. Therefore, try disabling the Security software you are using before trying again. If the software is disabled, and you are still experiencing problems, try our second solution. Another way to get around this error is to run iTunes using an Administrator account. First of all, make sure that you have log in to the account that is administrator. Find iTunes icon on the desktop or find it using the search feature. Then right click iTunes icon, and there will be the option "Run as administrator". Check if you are able to update iTunes now. The iTunes error 2 is often related to Apple Application Support that fails to be installed. You can try a standalone Apple Application Support install and see if it works. Here's how to do it. Step 1: Go to http://www.apple.com/itunes/download/ and download iTunesSetup.exe installer file to your hard drive. Step 2: Check if you have installed WinRAR. If not, just download and install it on your computer. Step 3: Right-click on iTunesSetup.exe and choose "Extract iTunesSetup". WinRAR will expand the contents in a folder marked "iTunesSetup." 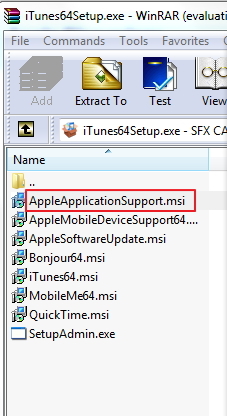 Step 4: In the folder, find and click on AppleApplicationSupport.msi to execute a standalone AAS install. Once the process is complete, iTunes will launch properly. Sometimes the process of installing iTunes may be affected by outdated Windows OS. It may therefore be worth updating Windows before attempting to install iTunes. Here's how to do it. 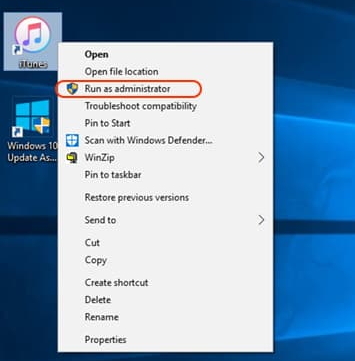 Step 1: Connect your computer to the internet and then click on the "Start Menu". 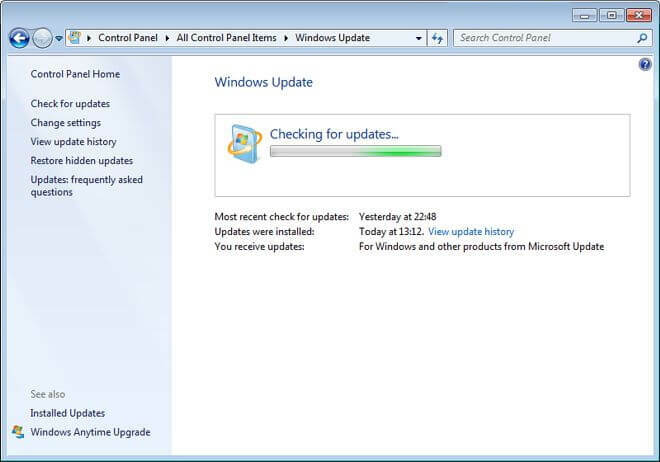 Step 2: Click on "Control Panel"=> All Control Panel Items=> Windows Update. Step 3: Click "Check for Updates". If there are updates available, click on "Install Updates" and then wait for the process to be completed. It may take a while depending on the size of updates. If none of the above solutions work for you, it maybe that iTunes itself is corrupt. In this case, you want to uninstall iTunes and all its related software components before reinstalling it. Here's how to do it. 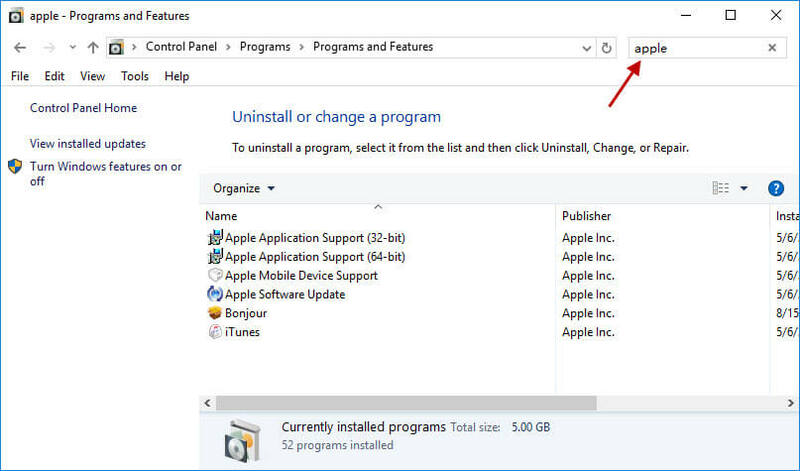 Step 2: Make sure that all iTunes components have been uninstalled. There may be some left over files that you want to remove. Step 3: If you are running 32-Bit version of Windows, Right-click on the Recycle Bin and select Empty Recycle Bin. Step 4: After all iTunes components have been deleted from your computer, restart the computer and download and install iTunes on your computer. If the problem persists but you still need to backup or restore your device, you can use an iTunes alternative like iMyFone D-Port Pro. The program is designed to backup and restore an iOS device in a flexible way and it is quite reliable. The following are some of the program's features. With D-Port you can choose to restore a partial backup without overwriting all the other data on the device. 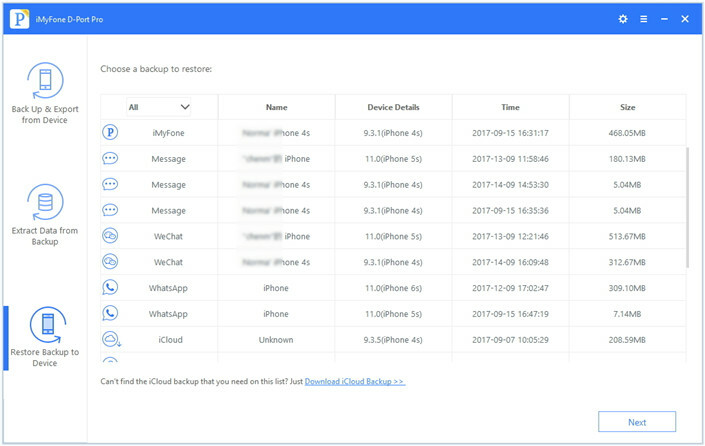 You can choose to restore just Messages, WhatsApp and WeChat data from iTunes or iCloud backup. It can also come in handy when you want to export data from your device, an iTunes backup or an iCloud backup. It supports to extract 16+ types of data. You can also selectively backup your iPhone/iPad/iPod. iPhone 8 and iPhone X are also supported. Step 1 Install and launch iMyFone D-Port Pro on your computer. Then connect your device to your computer. You will find all the backups stored on your computer on the screen. Choose an iTunes backup that you want to selectively restore and click "Next". Step 2 Choose "Restore Partial Backup". Then you need to choose the data type that you want to restore individually. 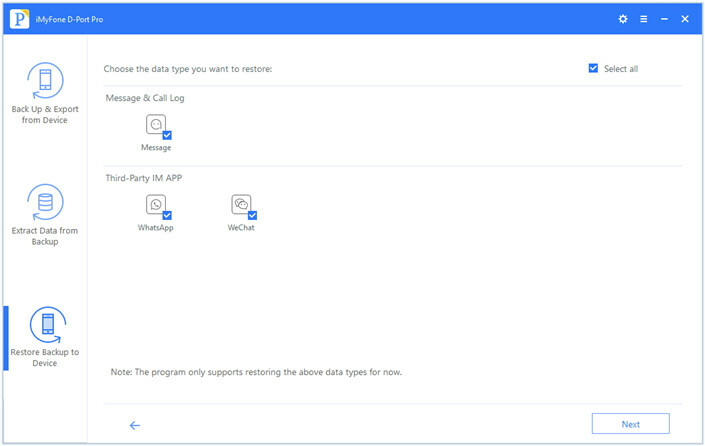 There are only 3 types of data supported yet which are WhatsApp, WeChat, Messages, and more apps will be supported in the next version. Step 3 After the scanning of the backup, you will be able to preview the details and confirm if these are what you want to restore. Finally, you just need click "Restore" and wait for a short while until the process finishes. 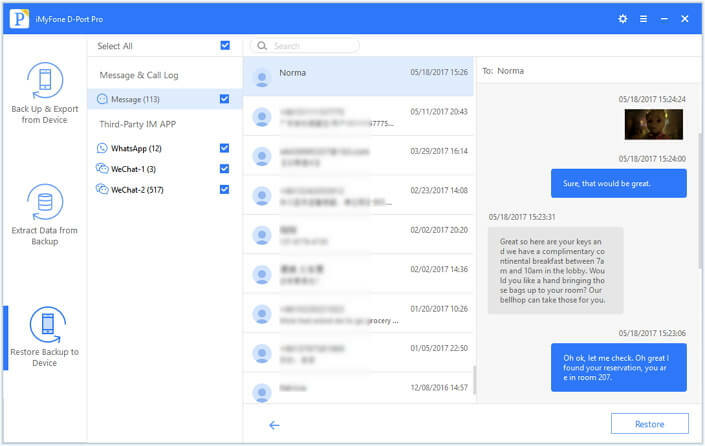 iMyFone D-Port Pro offers free trial version, so you can just download the free trial and have a try now.